The Valley Ranch community was developed nearly 40 years ago, on what was once marshland. Consequently, the ground shifts, presenting a need for regular maintenance on the pathways and low ground retaining walls. Valley Ranch HOA contacted Classic to remove the existing pavers and asphalt and replace them with concrete, in addition to completing some stone wall repairs with drainage work. 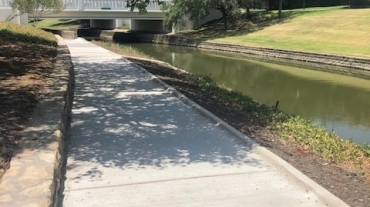 We removed approximately 4,496 square feet of existing pavers and asphalt, graded the subbase for concrete pour, set concrete forms, added cushion as appropriate, and added concrete with control joints and expansion joints. We also removed and rebuilt approximately 1,357 face feet of existing stone retaining wall, cleaning and reusing existing stones, and adding additional stones as needed to complete the wall to the existing height. From approval to completion, this project took a little less than four months and was completed during the springtime when weather is a major contributing factor to timelines.